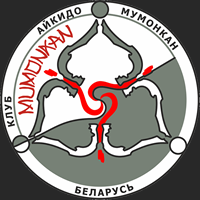 ﻿ What does Mumonkan Aikido Club emblem mean? Home » Questions about Aikido » What does Mumonkan Aikido Club emblem mean? 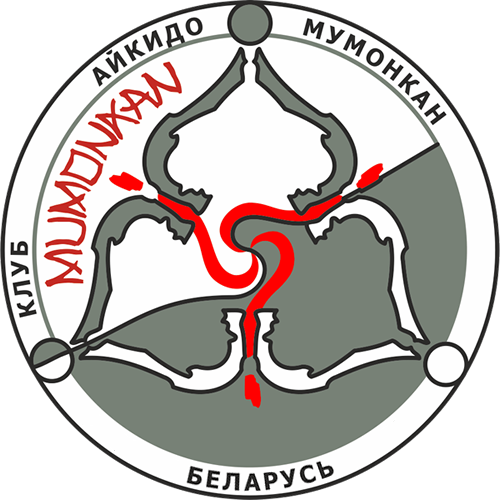 The emblem of Mumonkan Aikido Club is based on combination of three geometric figures – a triangle, a circle and a square. The founder of Aikido Morihei Ueshiba said: "The only way I can explain Aikido is to draw a triangle, a circle and a square" . Since these are the three most perfect proportions, in combination of which the integrity of Aikido philosophy is reflected. 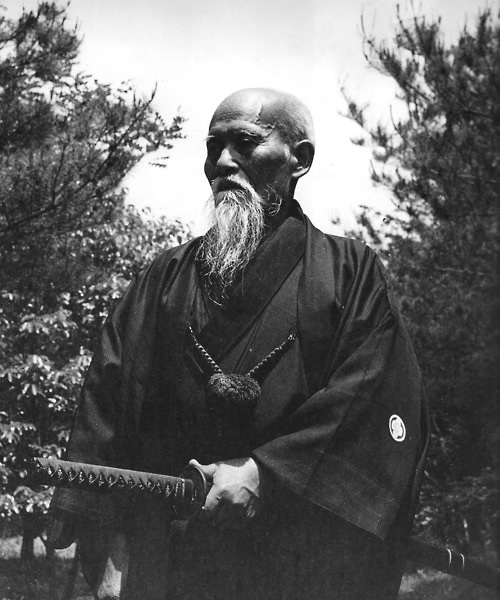 Aikido philosophy is aimed at making the world more harmonious by eliminating constant opposition and enmity between people. 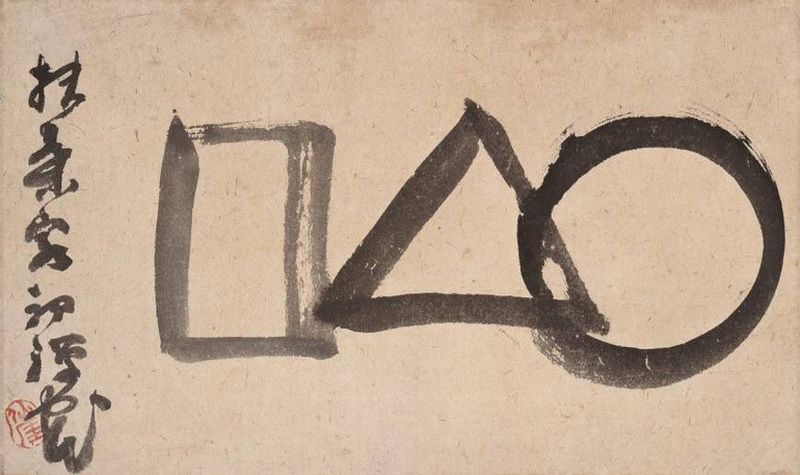 Japanese Zen teacher, artist and calligrapher Sengai Gibon who lived in the XVIII-XIX centuries (1750-1838), interpreted the circle, triangle and square as a triad: sky – man – earth. A triangle, a circle and a square, as three basic figures, were used as special symbols, not only in the East. The Ancient Greece and Medieval Europe give numerous examples of how these figures were used to construct various schemes of the Universe. 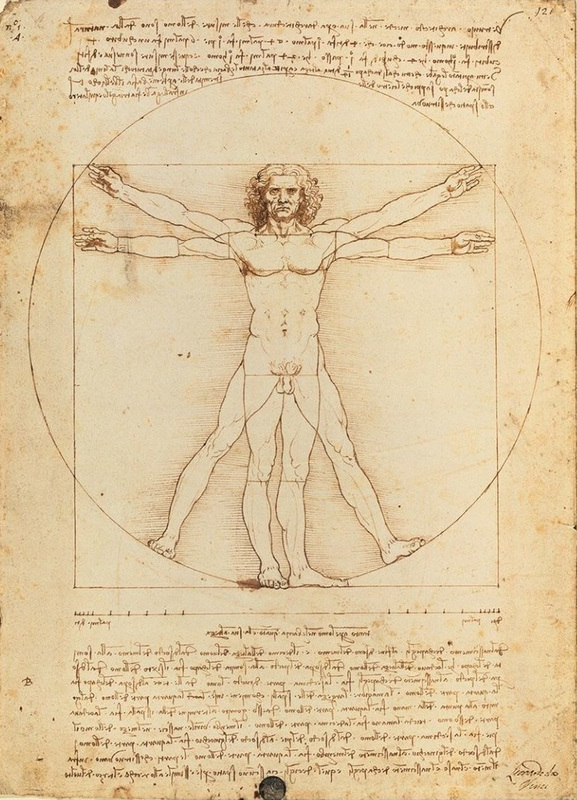 The famous "Vitruvian Man" sketch by the well-known Italian artist, sculptor and architect Leonardo da Vinci (1453-1519) may be taken as an excellent example. 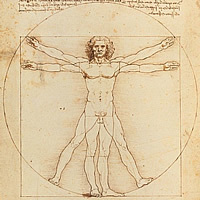 Thus, the figures of a circle, a triangle, and a square, united in one picture, have a strong and deep symbolism – a Man who transforms the Universe studying and using Aikido techniques, becomes more perfect. The triangle on the club emblem symbolizes the man and conveys the meaning of a solar sign, which is masculine, fiery, and vital. In a classic triangle there lies divinity, spirituality, intelligence and love. This and one more symbol – the ascending triangle – reflects evolution, development, and striving upwards. Namely the triangle is chosen as the central figure in the emblem of the club, as the Man is the base of all bases. The man perceives the inner world, as well as outer world through himself. The circle symbolizes the sky. This is a world that knows no boundaries – like a spiral or a circle, leading to infinity. It is a symbol of perfection. The emblem shows two circles – external and internal. The first represents an unknown world, everything that is outside of our consciousness, the second – all that we see and feel – the Universe. The square symbolizes the material world. It is the earth, fire, water, and air. The square is also the symbol of firmness and order. Material world, which is an integral part of human life, is represented by three squares, which are stylized like iris leaves. Three squares in the emblem represent a sign of three-dimensional perception of the world around. Why does the emblem of the club show iris? It is not a random choice. Iris is very meaningful for Japan. In Japan May 5 is celebrated as a holiday called "Children's Day" (Kodomo-no Hi). But before World War II, this holiday was called the "Feast of the iris" (Shobu-no Sekku) and up to the middle of the previous century it was considered to be the day of warriors. There was an interesting tradition – in homes where boys under 15 lived on that day there were bouquets of irises on the shelves side by side with samurai figures, armors, swords and other military equipment. 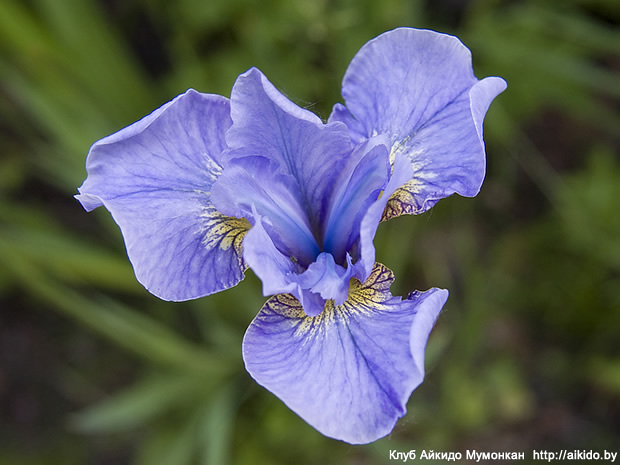 Since Mumonkan Aikido Club was founded in May 1997, it was decided to put the iris petals in the center of the emblem. Iris symbolizes courage, success and self-improvement. You walk the Universe alone". All images in the emblem go to a single point, to the center. All roads lead to this point, smoothly curving and invariably directing into it, into infinity, to a unique gate without gate. Not only roads, but questions also lead to these gates. At the same time, "the true answer is a correctly understood question" . The Universe itself is the unasked question. But when we deeply understand what the universe is asking us about, we already do not need the answer. 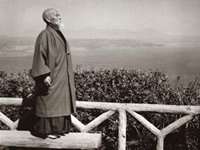 "The secret of Aikido is to merge ourselves in harmony with the movement of the Universe and bring ourselves into harmony with the Universe itself. 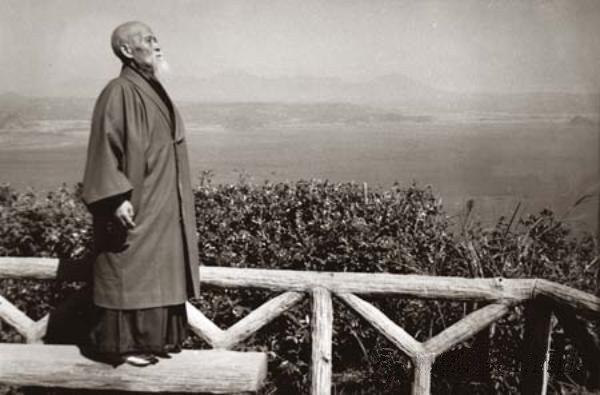 One who knows the secret of Aikido has the Universe in him and can say, «I am the Universe»" (O-Sensei Morihei Ueshiba, Aikido Founder). Тhe rules of behavior in the dojo and Aikido training. How to choose a kimono for Aikido?